Well, how can I explain this? I got some interesting calls today. It was Apple. And they wanted their phone back. This phone was lost, and then found. But from Apple's perspective, it could have been considered stolen. I told them, all they have to do to get it back is to claim it—on record. 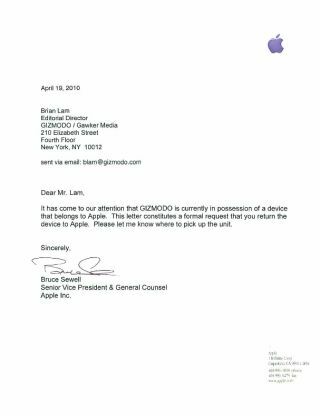 This formal request from Apple's legal department is that claim. It proves—if there was any doubt in your mind—that this thing is real. Here's Jason Chen, who has the iPhone. And here's his address. You two should coordinate a time. I'm sad to see it go. We reasoned this pretty little piece of hardware is probably something we'll see again some time soon, but who knows exactly when. For some of us, that date can't come soon enough.